ITER was born twice—once in 1985 in Geneva as an aspiration, and a second time ten years ago today (21 November 2006) by way of an international agreement signed in Paris to establish "the ITER International Fusion Energy Organization for the Joint Implementation of the ITER Project." 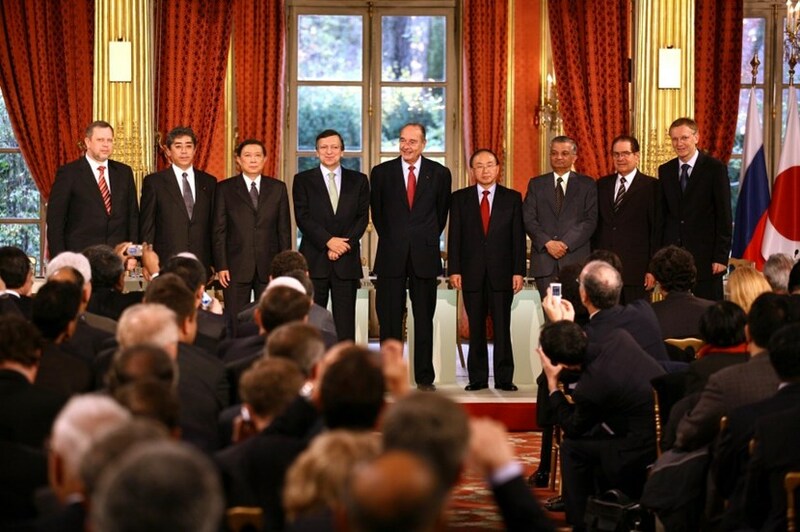 The signatories of the ITER Agreement, together with French President Jacques Chirac. From left to right: Vladimir Travin, deputy head of the federal atomic energy agency Rosatom, Russian Federation; Takeshi Iwaya, Senior Vice-Minister for Foreign Affairs, Japan; Xu Guanhua, Minister of Science and Technology, People's Republic of China; José Manuel Barroso, President of the European Commission; Jacques Chirac, President of the French Republic; Kim Woo Sik, Vice Prime-Minister of the Ministry of Science and Technology, Korea; Anil Kakodhar, Secretary to the Government of India in the Department of Atomic Energy, India; Raymond Orbach, Under-Secretary for Science at the Department of Energy, USA; and Janez Potočnik, European Commissioner for Science and Research. The project has come a long and hard way since the Geneva Summit, during which President Reagan and General Secretary Gorbachev advocated for "the widest practicable development of international cooperation" in obtaining fusion energy "for the benefit of all mankind." Seventeen years would elapse before agreeing on a final design for the machine, and four more to decide where to build the installation. On 28 June 2005, the seven members of the Project unanimously agreed on the site proposed by Europe, a 180-hectare stretch of land adjacent to one of France's largest nuclear research centres, and close to the small Provençal village of Saint-Paul-lez-Durance. Now came the time to formally establish the legal international entity that would tackle the huge task of organizing and supervising the construction of the ITER installation. Because France was the "Host State" to the project, the ITER Agreement was signed at the Elysée Palace in Paris. On 21 November 2006, high-level representatives from all the participating Members gathered under the gilded ceilings of the presidential palace to append their signature to the 34-page document. President Chirac of France praised the "unprecedented association of seven major partners [...] extending their hand to the future generations in the name of solidarity and responsibility." They were ITER ... but not quite.The men and women in this picture, taken only days after the signature of the ITER Agreement, worked under a variety of contracts out of temporary housing at CEA Cadarache. In Saint-Paul-lez-Durance where some 60 people were already at work in temporary buildings, it was a time for celebration. The new-born ITER Newsline (the weekly's first issue had been published one month earlier) quoted ITER Director-General nominee Kaname Ikeda saying that ITER could now "embark on its mission as a worldwide international cooperation to help create a new source of energy for humankind." All of this happened ten years ago to the day. The "mission" of 2006 has swung into spectacular action, with buildings now rising high above the ITER platform and components steadily exiting factories on three continents to be delivered to the construction site. ¹ Click here for the special issue of the IAEA newsletter on the ITER Agreement, dated December 2006.